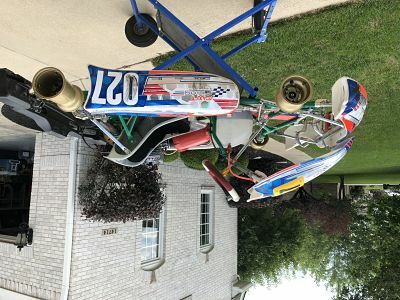 2016 Tony Kart Racer 401 rolling chassis. Bought in 2016 while son was still in sportsman to practice. Raced Yamaha JR at KRA all 2017 and first 8 KRA races of 2018. Also ran maybe 5 club races at other tracks. Less than 10 practice days. Kart still has plenty of wins left in it. Have new set of Tony Kart stickers and another new set of custom stickers if you want them. 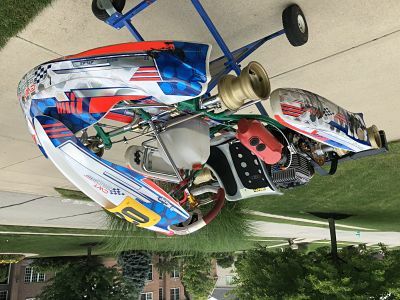 Comes with Tony Kart Magnesium wheels. Tillett T11 MS installed. Used OTK size 2 seat also available if you want it. Has normal M6 front panel and also comes with new M7 panel. Has Mychron bracket on steering wheel. Pedal extensions available if needed. Chassis Only. Engine and mychron in pictures not included. Chassis can be seen at OVKA race aug 11th and aug 18th.